The Norwegian Helsinki Committee is deeply distraught to learn of yet another violent attack on human rights activist and employee of Human Rights Center Memorial, Bakhrom Khamroev, in Moscow on Monday June 6th 2011. - We are concerned for Khamroev’s safety, said Secretary General of the Norwegian Helsinki Committee, Bjørn Engesland. - We consider it likely that this violent attack is part of an attempt to intimidate Memorial’s employees, as well as human rights defenders in Russia in general. Bakhrom Khamroev is a citizen of the Russian Federation based in Moscow, who has been involved in the protection of human rights both in Central Asian republics as well as in Russia through Memorial’s Central Asia Program. In 2009, the NHC brought up Khamroev’s detention and deportation while carrying out monitoring work in Osh, Kyrgyzstan. In December 2010, an attack on him by Russian security officers in Moscow was given wide international attention. On June 6th around 6:30 PM, Khamroev went to his Moscow apartment to gather his bags before travelling to Murmansk, where he was set to be present during the release of a citizen of Uzbekistan who lodged a complaint against Russia with the European Court of Human Rights (ECHR) in 2005. The NHC is concerned that this second serious attack on Khamroev in six months may be connected to this case. Outside the entrance of his apartment building Khamroev noticed an unfamiliar man on the playground nearby, who started speaking on his cellphone when Khamroev approached. Entering the building, Khamroev noticed a second unknown man standing on the stairwell by the mailboxes between the first and second floors. Khamroev waited for the lift to arrive to take him up to his 5th floor apartment, but instead a man came out of the lift and hit him in the face with brass knuckles. Khamroev fell to the floor, the man continued to hit him and kick him, while the man on the stairwell descended and sprayed him in the face with tear gas. The assailants then left, stealing nothing. Khamroev managed to reach his apartment on his own, from where his wife was able to help him to the hospital. The attack on Khamroev on June 6th follows another violent attack that took place on December 7th, when Khamroev was severely beaten by security service officers in Moscow. Arriving to an apartment building where an operation directed at migrants from Central Asia was being carried out, Khamroev was beaten until unconscious and suffered a concussion. While a criminal case was opened by Russian authorities, the matter seems now to have been put on hold. The NHC suspects that the June 6th organized attack on Khamroev is connected to his involvement in the case of Yusup Khasymakhunov, a citizen of Uzbekistan who was arrested in Russia in 2004, and the first to be charged with membership of the organization Hizb-ut-Tahrir in the Russian Federation. 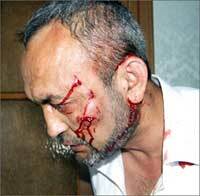 With the help of Memorial and others, Khamsymakhunov filed a complaint to the ECHR in 2005. Having successfully passed through the initial stages, the ECHR is likely to issue a verdict in the case this year. This week, information was received that Russia might extradite Khamsymakhunov to Uzbekistan. Khamroev was about to travel to Murmansk to meet Khamsymakhunov upon his release from prison when he was attacked. The Norwegian Helsinki Committee encourages Russian authorities to take all necessary measures to identify Khamroev’s attackers, and to ensure the safety for human rights activists working in the Russian Federation.